Preheat the oven to 160ºC/320ºF/gas 3. Grease a 20cm springform cake tin with a little butter and line with greaseproof paper. Rest a medium heatproof bowl over a pan of simmering water on a medium-low heat. Break in the chocolate, roughly chop and add the butter, then allow to melt, stirring occasionally until smooth and glossy. Carefully remove the bowl from the heat, stir in the coffee and set aside to cool slightly. Separate the egg yolks and whites between two large bowls. Whisk the egg whites for 1 to 2 minutes, or until soft peaks form. Add the sugar to the yolks and beat for 7 minutes, or until pale. Sift in the cocoa powder and 1 pinch of sea salt, then gently fold through to combine. Stir in the melted chocolate mixture, then gently fold through the egg whites until smooth. Transfer to the prepared tin and place in the hot oven for around 1 hour, or until an inserted skewer comes out clean. 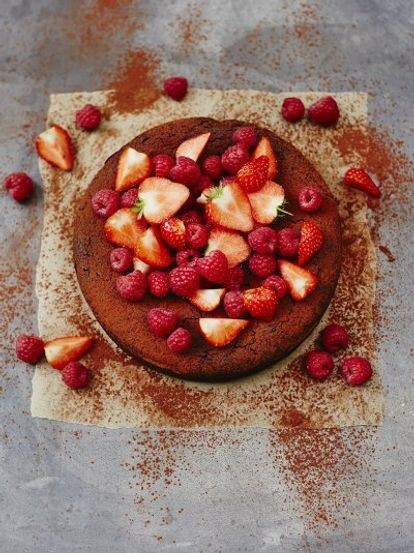 Allow to cool completely on a wire cooling rack, then serve with a dusting of cocoa powder and fresh berries.